Members of the Arizona Hombu Dojo have been invited to present a traditional Okinawan martial arts demonstration to assist in raising money for Pediatric Autoimmune Neurological Disorders at the HUMI event http://www.humievent.com/ in Carefree, Arizona on March 12th, 2016. The demonstration will be led by Black Belt Hall-of-Fame inductee Soke (Grandmaster) Hausel and members of the Arizona Hombu Dojo, Chandler, Gilbert & Mesa Arizona. Soke Hausel is a former professor of martial arts at the University of Wyoming, where he taught a variety of martial arts for 3 decades and has more a martial artist for more than 5 decades. He is a member of several Halls-of-Fame for martial arts, education and geological sciences. 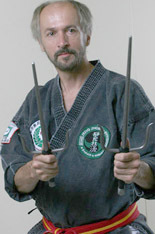 Soke Hausel is the world head of Seiyo No Shorin-Ryu Karate Kobudo Kai and an active member of Juko Kai International. Accompanying Soke Hausel will be Dr. Neal Adam (6th dan) (a professor at Grand Canyon University), Sensei Bill Borea (3rd dan) (retired air force pilot), Paula Borea (2nd dan) (a Japanese American of Samurai Heritage), Patrick Scofield (2nd dan) (an engineer), Ryan Harden (2nd dan), as well as student members Dennis Ingram, Suzette Denvir, John Denvir, Rihanna Denvir and Amira Rodriguez. The 25 minute demonstration will include Japanese samurai sword and halberd (naginata), Okinawan kobudo (peasant weapons), Okinawan karate and Okinawan Shitai Kori (body hardening). While at the University of Wyoming, Soke Hausel and his students presented many very popular karate demonstrations at UW’s men’s and women’s basketball games.